Wickets at regular intervals led to the Legends' downfall. After their 10-wicket defeat against Maratha Arabians in their previous encounter, Rajputs, led by Brendon McCullum, made an incredible comeback in the Qualifiers of the T10 League. They thumped the Punjabi Legends by 12 runs at Sharjah Cricket Stadium. The Legends would be disappointed that they couldn’t follow up their victory against Kerala Knights with another win. The Legends won the toss and had no hesitation to field first. Rilee Russouw and wicketkeeper Mohammad Shahzad got their team off to a brilliant start with a stand of 34 runs from 18 balls. The stand was broken by chinaman bowler Zahir Khan, who nipped out Russouw after the left-hander scored 26 from merely 11 balls. Ben Dunk threatened with three glorious boundaries. Unfortunately, he became Zahir’s second victim. Thereafter, Shahzad and skipper Brendon McCullum cobbled together a stand of 34 runs and build the platform for an onslaught in the final two overs. Former Indian fast bowler Praveen Kumar got rid of Shahzad for 24 runs. 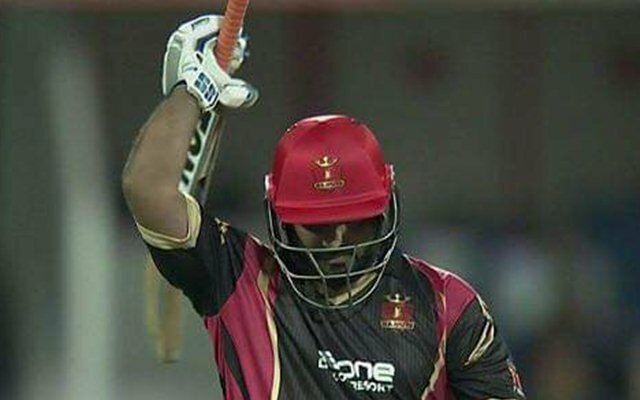 McCullum and Carlos Brathwaite scored quick-fire 28 and 23 runs to propel Rajputs’ score to 117. The target wasn’t a daunting one by any stretch of the imagination, but the Legends made a complete meal of it. Evin Lewis fell prey to Carlos Brathwaite in the very first over. Luke Ronchi couldn’t make an impact either with the willow as Munaf Patel accounted for his wicket in the second over. Left-arm speedster Tymal Mills removed Shaiman Anwar to pick the Legends’ third wicket. Umar Akmal looked promising during his stint in the middle. He scored 34 runs from 19 balls after which Mills dismissed him. Tom Moores and Chris Jordan perished for single-digit scores. However, Philip Salt and Hasan Khan wasn’t ready to throw in the towel and tried to get their team home. Nevertheless, that wasn’t the case, though both remained not out on 34 and 15 respectively.
.@RajputsT10 beat @PunjabiLegends_ by 12 runs. Legends make 105-6 in their 10 overs.